Flipping through your family’s high school yearbooks can be an eye-opening experience. Besides seeing how your elders evolved through their awkward years, you gain an understanding of the environment that shaped them. The rebellious streak now expected of teenagers tends to be suppressed in yearbooks published before the 1970s except for in-jokes buried in poems and photo captions. 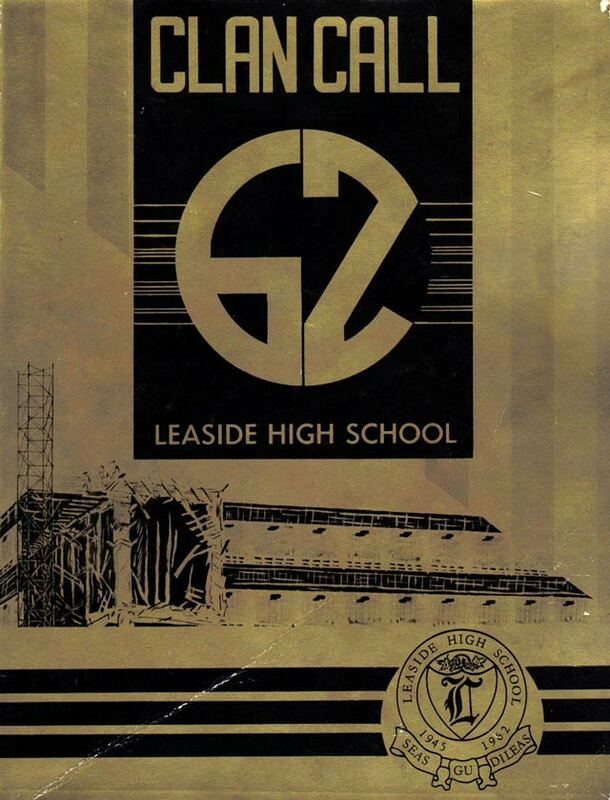 The 1961/62 edition of Leaside High School’s Clan Call yearbook contains the usual assembly of class photos, cheeky graduate profiles, clubs, cheerleaders, poetry and heavily made-up drama students. What stands out is the high number of greetings from municipal officials and pages devoted to submissions from school staff. Depending on your point of view, this represents a strong sense of community and a great sense of respect for the school’s administration by the student body or is a case of the yearbook staff acceding to the whims of those in charge. Leaside High School’s origins date back to 1940 when grade nine classes were first offered at the recently-opened Rolph Road Public School. Succeeding grades were gradually added so that by the time L.H.S. was officially established for the 1945/46 school year, 230 high school level students living in the town of Leaside attended classes at Rolph Road while 135 others attended schools within Toronto. The need for a permanent building to house all of these students gained momentum when three high schools (Jarvis, Oakwood and North Toronto) refused to accept any more fifth-year students from Leaside. Classes remained at Rolph Road until the first phase of the current building opened to students in the fall of 1948. This yearbook featured the final message to students from Leaside mayor Charles Hiscott (1908–1974). First elected as a town councillor in 1948, Hiscott assumed the mayoralty in 1956 and guided Leaside through a period of rapid change in its infrastructure. The largest project during his term was the development of Thorncliffe Park into a residential/commercial area. Hiscott’s name was attached to the bridge connecting Overlea Boulevard to Don Mills Road upon its completion in 1960. Hiscott would not see out the school year as mayor. The Toronto Star reported rumours of his resignation on February 21, 1962, which centered on his desire to rebuild family finances eroded by the mayor’s low annual salary of $2,700 (just shy of $20,000 when adjusted for inflation). Hiscott announced his departure the next day and was promptly appointed to Leaside’s newly-created town treasurer post. A delegation of angry ratepayers showed up at the next town council meeting to protest the speed at which the position had been devised (treasury had been the responsibility of town clerk R.B. Burgess, who was set to retire after 30 years of service) and the lack of a job posting. All councillors, with the exception of Beth Nealson, voted in favour of the new position. New mayor Lloyd Dickinson would go on to lose to Nealson by five votes in the fall municipal election. It is normal to feature class trips and student exchanges in the yearbook. Cases of the vice-principal submitting a piece on their summer tour through Europe are less common, especially a trip diary excerpt with a cliffhanger. Did the class of 1962/63 find out what wonders unfolded in Northern Italy? Did his trip turn into a scene from a Fellini film? 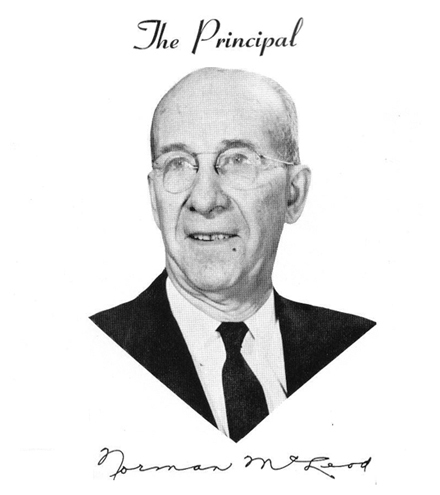 We can tell you that W.C. Macready was appointed as the school’s first vice-principal in January 1950 and that he succeeded McLeod as principal. Other unusual staff-centric features include a letter from the school chaplain that relates how his sabbatical in the Bahamas is going and an autograph page that leaves only 25% of its space for “have a great summer” notes below the facsimiles of staff signatures. The cover design reflects the physical changes that occurred to the school over the course of the year. Cover artist Karl Sotiroff’s design “is representative of our school’s past and present. The bars indicate the years, and population increases in its history. Construction of the new wing is well depicted.” The new wing, built to house the new vocational programs rolled out across the province by the Ministry of Education, was officially opened in September 1963. 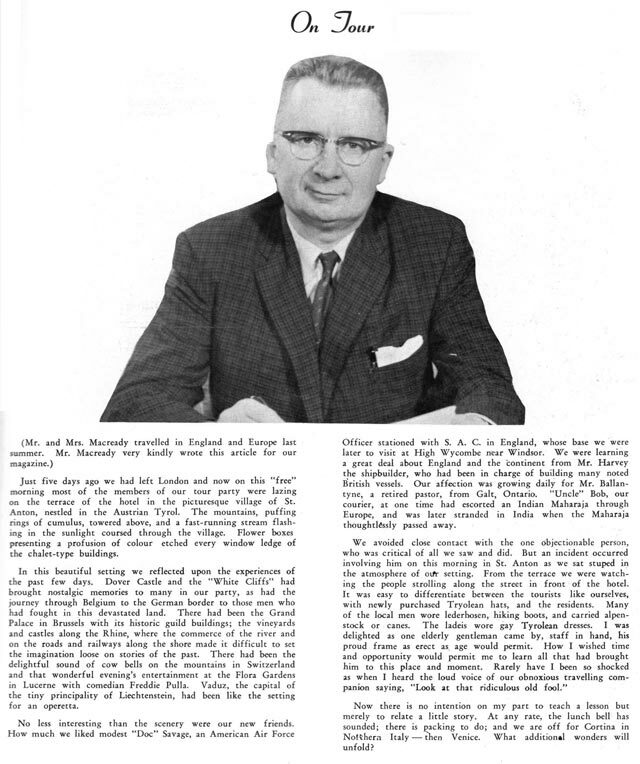 All images from the 1961/62 edition of Clan Call.